In a statement issued Tuesday, on the one-year anniversary of ground-breaking, city officials said construction of new Mosaic Stadium is approximately 44 per cent complete. "This is a tremendous source of pride for our community and we are very pleased with the progress the PCL construction team has made over the last year," Regina's mayor, Michael Fougere, said in the media release. 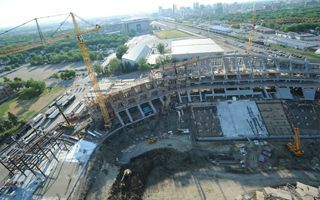 "There is a lot of activity in each area of the site and it has been incredible to witness how the stadium has taken shape." Currently most advanced part is the east stand, already reaching its final height. According to the city, work on the west side of the stadium will continue through the summer and will soon mirror what has already done on the east side. As well, later in 2015, the structural steel work for the spectator roof will start to be installed on the southeast corner.